Here is an excerpt from the Preludio of Bach’s E major Partita for solo violin. 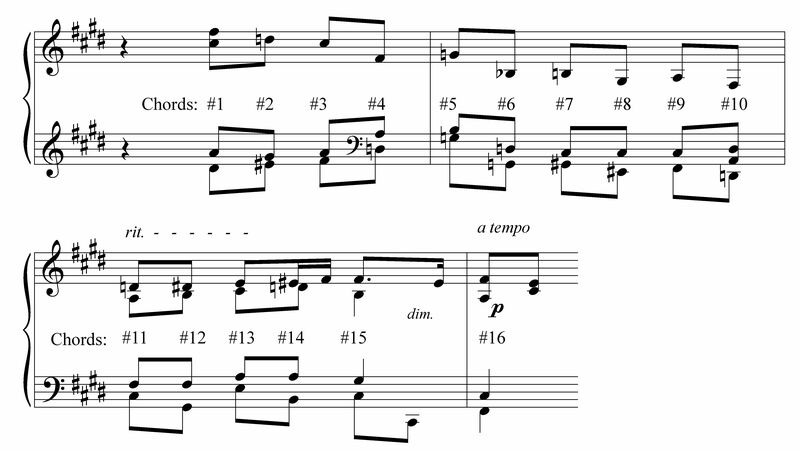 If you were composing a free piano arrangement of this passage, how would you go about it? Rachmaninoff went about it by writing what is, in my opinion, one of the most delicious passages in Rachmaninoff’s oeuvre, and that’s saying a lot. The excerpt below if from Rachmaninoff’s arrangement of Bach’s Preludio. (He created a suite which includes arrangements of the Gavotte and Gigue from the same partita.) The fact that this harmonic progression is un-Bachian doesn’t matter, for this is Rachmaninoff-Bach rather than Bach-Rachmaninoff. Rachmaninoff knew as much as anyone that one cannot improve Bach. Rachmaninoff took Bach and created something altogether different. He created something wild and wonderful! At any rate, I suspect that Rachmaninoff had all of these considerations, and perhaps others, in mind when he chose the minor Neapolitan. More on Rachmaninoff’s voice leading. I have always thought that Rachmaninoff’s music gets short-shrifted by many who consider that the seemingly superfluous barrage of notes on the musical surface hides a lack of depth beneath that surface. To the contrary, it has always been my opinion that Rachmaninoff’s piano music is quite orchestrally composed, with contrapuntal lines pervading the texture at many levels. One can easily imagine an oboe playing an inner line here, a cello playing a longer line there, and so forth. While there may be better examples in Rachmaninoff’s oeuvre to show what I’m talking about (a great example being the Eb major prelude from the Op.23 set, perhaps the subject of a future blog post), we can see his careful voice-leading even here. 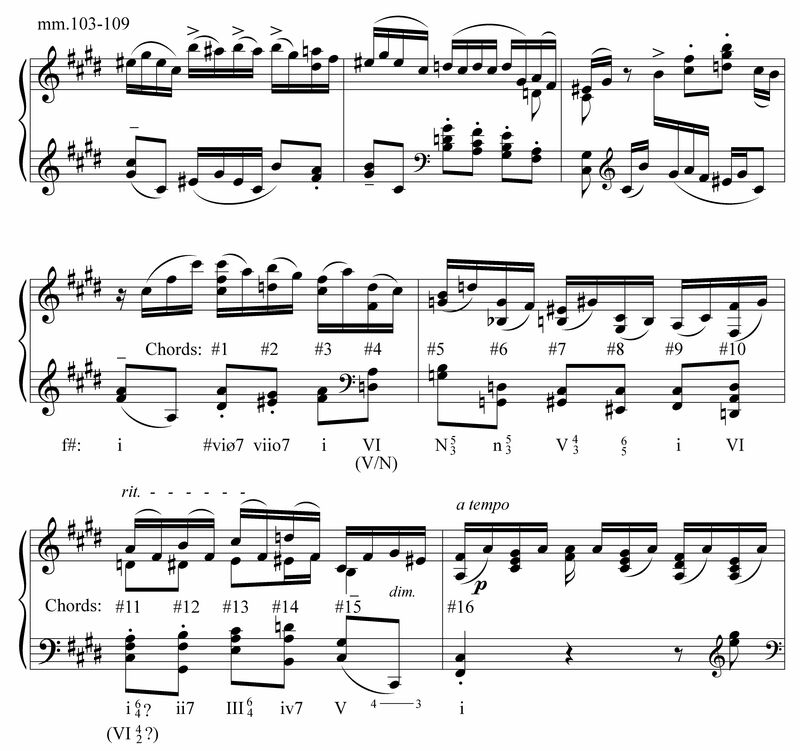 Below is the same passage above, but with Bach’s original notes stripped (except on the couple occasions when Bach’s notes connect with Rachmaninoff’s voice leading, as in the A at Chord #9). From chords 5 to 8 the bass and upper voices are linked, running in parallel motion. From chords 11 to 16, the two upper voice are more linked, with parallel rising lines, while the bass and tenor voices are linked in a kind of sequence—a sequence that might help explain Chord #11. Perhaps Rachmaninoff retrofitted the “fourth-seventh” interval pattern at Chords #13-14 back onto Chords #11-12. This might help explain the apparent VI42 chord, which does not function as a typical seventh chord. A better explanation might be to ignore the D-natural as a harmonic component, since it belongs to that embellishing chromatic rising line. All other seventh chords have properly resolving sevenths (though the resolution of the seventh of the ii7 chord (A in the tenor) is transferred to the bass. All things considered, this is Rachmaninoff at his most delicious. This entry was posted in Uncategorized and tagged analysis, bach, comparison, rachmaninoff. Bookmark the permalink.